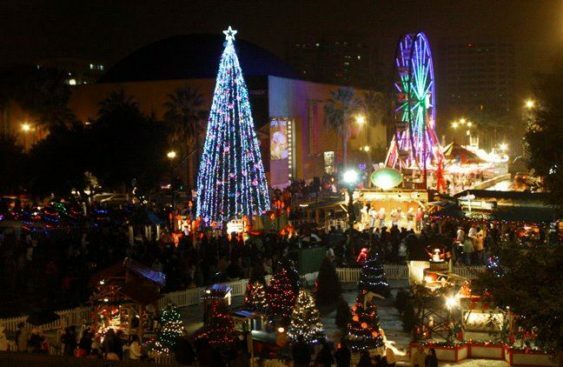 For over 30 years, Plaza de Cesar Chavez has been transformed into Christmas in the Park, a holiday fantasy with over 60 musical and animated exhibits, glittering lights and the 60-foot Community Giving Tree. One of the largest exhibits, the Lima Train, includes a melting snowman, caroling mice and elf woodcrafters. Guests enter a winter wonderland of lights, songs and local entertainment while strolling through an enchanted forest of decorated trees. Children can have their photograph taken with Santa, watch nightly entertainment and enjoy holiday themed refreshments. It’s free to visit Christmas in the Park with your friends and families, but it is expensive to produce Christmas in the Park every year and they ask you to visit the food court or to make a donation to the program. Christmas in the Park kicks off on Friday, November 23 2018 to December 25, 2018. Christmas in the Park officially opens for the 2018 season on November 23rd, starting with the Community Giving Tree Lighting Ceremony. From then on, the event is open every day, including Christmas, from 9 am to midnight through December 25, 2018. Except for the date, the 2018 event details of Christmas in the Park has not been released yet. Please check back for more updates.